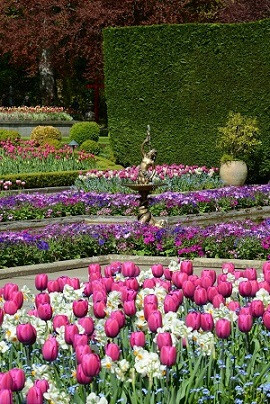 Few places in Canada can quite compare to the beauty of The Butchart Gardens in Brentwood Bay, BC. This oasis filled with rich local history is more than just a simple flower garden. Originally a cement plant and quarry developed by Robert Pim Butchart in 1904, his wife, Jennie Butchart, sought to create a place of beauty. As the limestone deposits were exhausted, she filled the remaining enormous pit with topsoil and transformed it into the now iconic Sunken Garden. And over the past hundred years, it’s continued to grow. “Butchart Gardens is comprised of several different gardens,” says Daphne Gardner, Manager of Public Relations. You can now stroll through the peaceful Japanese Garden above Butchart Cove, an Italian Garden where the Butchart’s tennis court used to be, see exotic plants in the Mediterranean Garden, and breathe in the heady scent of the Rose Garden. Even better, it’s open every day of the year, including Christmas Day. The gardens can be enjoyed during any season, each with its own unique beauty. From fireworks in the summer to an extensive Christmas lights display to thousands of tulips blooming in the spring, there’s always something special to behold. 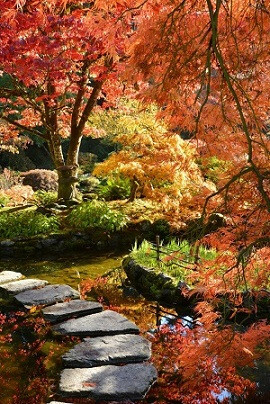 “I absolutely love the Japanese Garden in the autumn,” says Gardner. The Concert Lawn Walk adds its own flair, with totem poles carved by artists of the Tsartlip and Tsawout First Nations overlooking the Fireworks Field. And the domed Children’s Pavilion contains the Rose Carousel—a menagerie of 30 hand-carved wooden animals and chariots. This lovingly crafted carousel is very popular with all ages, and wheelchair accessible to boot. Places to eat are scattered throughout the estate. “People are welcome to bring their own picnics in the summer, but we also have the Blue Poppy Restaurant, the Dining Room, Coffee Shop, and Annabelle's Café.” Seasonally, popcorn and hot dog stands offer a more casual snack, and Gelateria Benvenuto in the Italian Garden offers homemade gelato.